Denshi Danshi have been around for 20 years; the French veterans worked with the likes of Blue Planet corporation and held a central role during the POF label existence. Their tracks offer a mixture of melodic and hypnotic Goatrance with surprising breaks and acidic twists gallantly breathed by their all-analog gear. The album starts with the floating “Dancing Shiva” that ends in a boiling climax! Next is the Live remix of the “Mariposa” track released in 96 with POF with extra crazy acid drifts!!! Flash forward, “Fluid Dynamics” was produced only a couple of months ago. This pack of energetic rhythmic & acidic lines is evidence that Christophe & Saïd are still full of resources! For those new to the scene, we are releasing a true jewel, the re-mastered version of “Feed The Mugwumps”, one of the most recognizable tracks of 97. Tribal, jumpy to the core, and full of killer acid lines that will make you howl on the dancefloor!!! Then “Vanaspati” offers a typical French oldschool scene feeling, before “Make Make” and “…The Ladder” blow your brain away with an avalanche of melodies and ecstatic twirls! “Mars Base Alpha” keeps your body hot with a remarkable drive, before “Tsuki” tears you apart with its manic acid loops and syncopated rhythmic! “Maelstrom” carries on as another one of those surprising crazy tunes at the crossroads of acid, tribal techno and goatrance with cheeky breaks. “Kraft Karamel” completes the album with a deep, hypnotic, warm, sci-fi downtempo atmosphere. 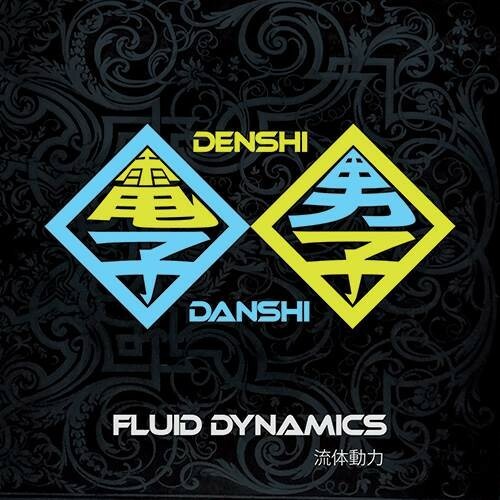 Completely non-standard and fully danceable, “Fluid Dynamics” will amaze you and drive you nuts on the dancefloor. Welcome back, Denshi Danshi! Like usual this compilation is crystal-clear mastered by Tim Schuldt!